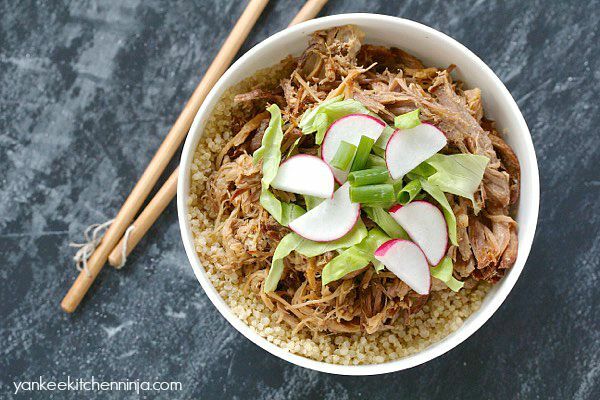 Sweet and spicy slow cooker pulled pork, combined with quinoa and fresh veggies, is a no-effort, tasty weeknight dinner that's also gluten-free. 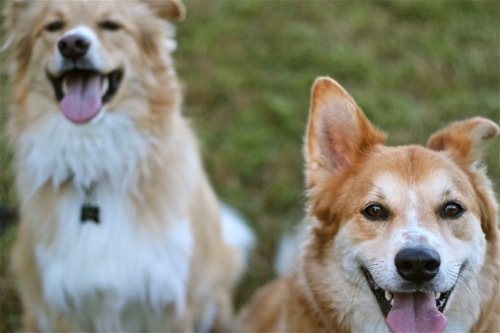 Regular readers are aware that I am a fur mom to a couple of nutso dogs. I consider them my babies (and, OMG, when did I become that crazy pet lady??!!). But apparently sometimes I think of them as too human and forget that they are really just food-crazed wildebeests who only occasionally listen and do what they're asked. By now, you're probably asking yourself, what the heck does this have to do with slow cooker pulled pork? As a food blogger, I'm always trying to get the perfect hero shot when I photograph my recipes. This photo shoot was no exception. Since I don't have a swanky expensive tripod with a crane arm like many of my blogging compadres, if I want to get a good overhead shot of a recipe, I often have to photograph my recipes on the floor. Read that again: On. The. Floor. I bet you can see where this is headed. I left a giant bowl of pork unattended ... on the floor. There are several pieces of good news resulting from this debacle. 2) No one threw up or had to go to the doggie emergency room. 3) This sweet and spicy slow cooker pulled pork is 100 percent dog-approved. 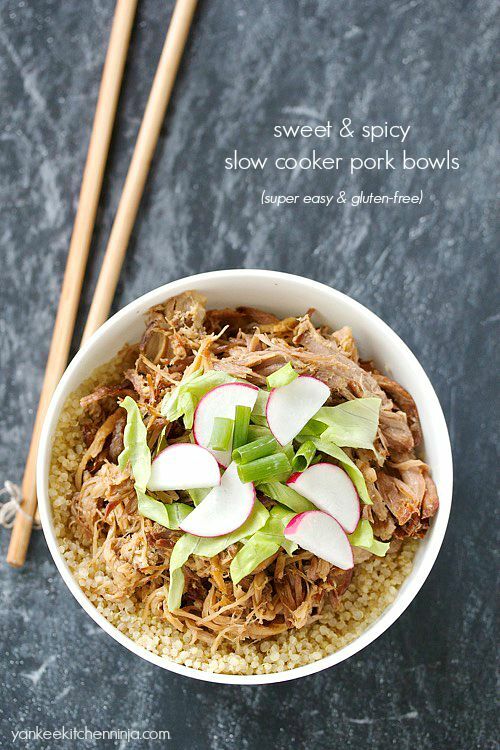 Re: good outcome #1 -- This is a slow cooker recipe, so it's super easy. Set it up in the morning and it will be ready when you get home. My favorite kind of meal! Re: good outcome #2 -- It's pretty darned amazing, given that there was a good half of a pound of pork in that bowl. 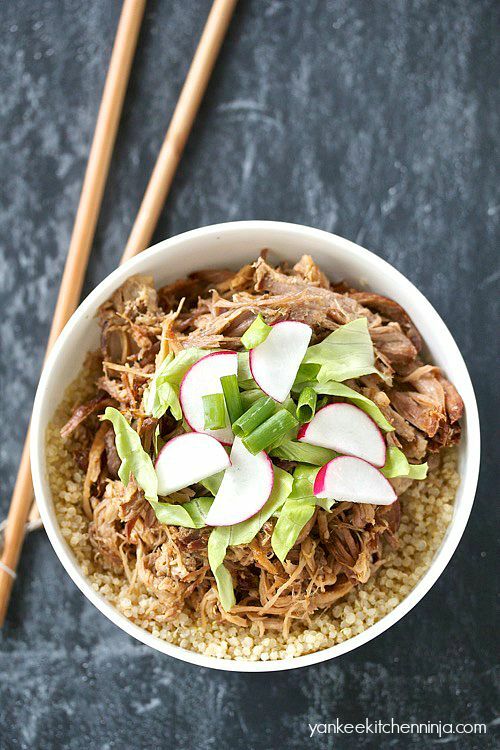 Re: good outcome #3 -- Just like my dogs, I know you, too, are going to love the sweet and spicy Asian flavors, which make this not your average slow cooker BBQ pulled pork but something more special, more exciting. I like to serve it over quinoa and topped with some crunchy veg but you could just as easily turn it into fun little sliders, sandwiches or lettuce wraps. Just don't ever -- EVER -- put them on the floor. Do you have food-crazed pets? Can you relate to this post? I'd love to hear your funniest counter-surfacing story. Leave a comment: The Ninj wants to know. Whisk together the sugar and salt in a small bowl. Rub the mixture all over the pork and set the pork into the crock of a large slow cooker. In another bowl, whisk together the ginger, vinegar, oil, stock, chili paste and soy sauce. Pour half of the sauce mixture over the pork; refrigerate the remaining sauce. Cover the crock and cook on LOW for about 10 hours. Remove the cooked pork and place it in a large bowl. Shred with two forks, mixing in about a 1/4 cup of the cooking liquid from the crock. 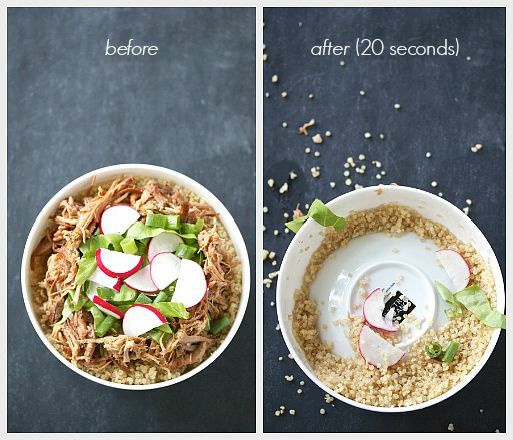 Serve in bowls over quinoa, topped with green onion, radishes, lettuce and reserved sauce. Too funny (sorry)! My pooch is the same way -- follows me everywhere in the house, and is my photography sidekick (mostly looking for spills)! This sounds great, so no wonder the dogs loved it! Love how you serve it over quinoa! Yum! Milo: 2# of sour cherries, 1/3 of a flat of blueberries, 1quart of yogurt laced water from a yogurt laced container soaking in my sink. Vixen: Pushed a chair across to reach a table, eat a plate of cookies, push the plate to the floor shattering it. Reached the top of a refrigerator to eat cereal. Pippin: zero, nada, nothing, cause the Pippie is too short to reach anything good.